This distinguished name is of Norman, Old French origin, introduced into England after the Norman Conquest of 1066. It has two quite distinct interpretations: firstly, the surname may be locational, from places called Courtenay in the regions of Loiret and Gatinais which are named from a Gallo-Roman landlord "Curtenus" (a derivative of the Latin "curtus", short), with the locational suffix "-acum". The second possible derivation of the surname is from a nickname for a person who had a snub nose, from the Old French "court, curt", short, with "nes", nose. Many early European surnames were created from the habitual use of nicknames, often bestowed with reference to a person's physical attributes or peculiarities. 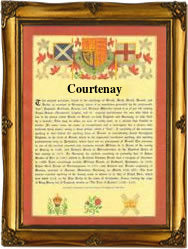 In some cases, bearers of the surname may be of Irish descent, since Courtney is also an Anglicized form of the Gaelic "O'Curnain", descendant of Curnan, from an Old Irish personal name of obscure origins. Recordings of the name from London Church Registers include: the christening of Thomas Courtney at All Hallows, London Wall, on November 11th 1569, and the marriage of William Courtney and Mary Lucas on March 22nd 1590, at St. Dunstan's, Stepney. John Courtney and his wife, Sybbill, were early emigrants to America, leaving London on the "Paule" in July 1635, bound for Virginia. An early Coat of Arms granted to the family depicts a blue fesse between three torteaux on a gold shield. The first recorded spelling of the family name is shown to be that of Reginald de Curtenay, which was dated 1164, in "Feudal Documents from the Abbey of Bury St. Edmunds", Suffolk, during the reign of King Henry 11, known as "The Builder of Churches", 1154 - 1189. Surnames became necessary when governments introduced personal taxation. In England this was known as Poll Tax. Throughout the centuries, surnames in every country have continued to "develop" often leading to astonishing variants of the original spelling.